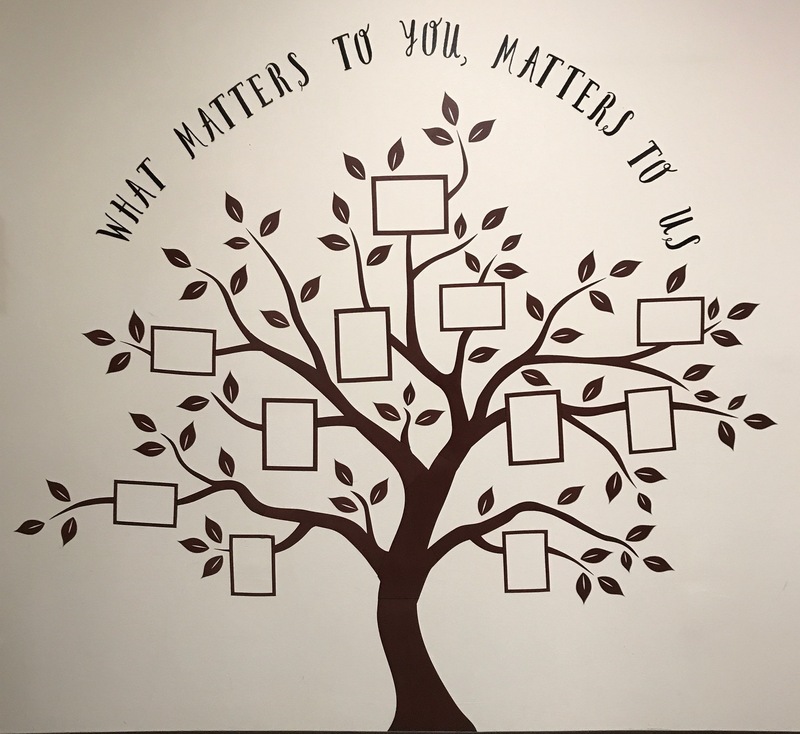 MHVC and its partners have embraced the new initiative, "What Matters to You?" (WMTY) and made it their own. 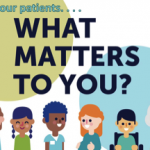 In May 2017, MHVC announced its “What Matters to You” (WMTY) campaign (article here), which was launched on international “What Matters to You Day” (June 6th) with a webinar and subsequent events around the region. “Because the message is so simple and compelling, it is resonating with our partners, patients, and just about everyone else,” according to Dr. Damara Gutnick, MHVC Medical Director. 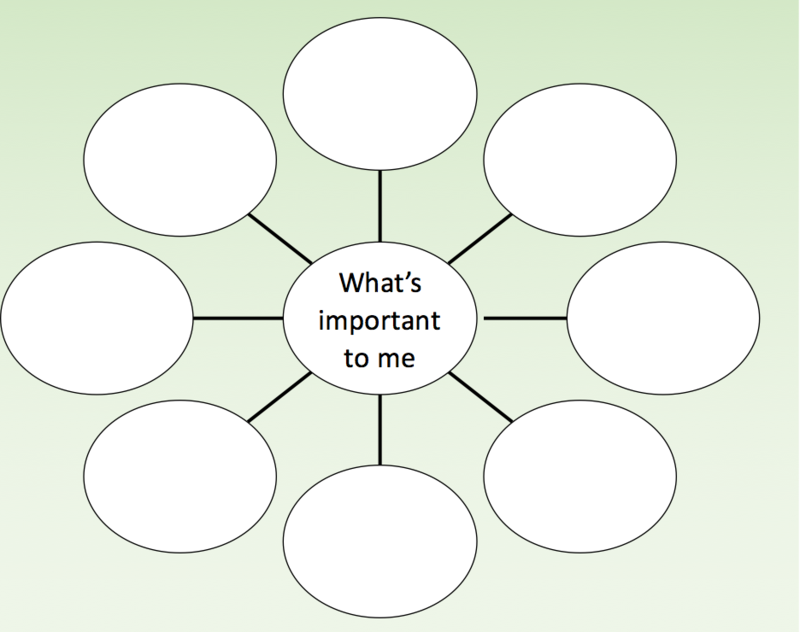 The worldwide “What Matters to You” initiative was introduced by the Institute for Healthcare Improvement (IHI) in 2012. The first WMTY Day was started in Norway in 2014 and has been held annually around the world since then. 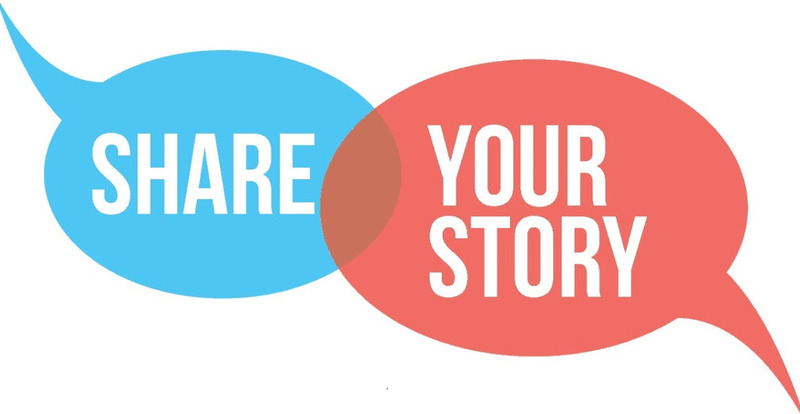 Every year, on or around June 6, MHVC encourages partners to have the WMTY conversation with patients. “The goal is to encourage partners to keep having these conversations beyond WMTY day,” said Dr. Gutnick. Videos, webinars, worksheets, buttons, posters -- download and connect to all the tools you needs to make WMTY a success in your organization. British Columbia with downloads and other resources. Guide to Having Conversations About What Matters is especially useful. Skills for WMTY Conversations walks you through asking the questions, reflecting on your relationship, and listening to answers. Scotland with downloads and other resources. 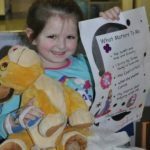 Why is it important to ask WMTY? Worksheets, posters, buttons -- click the links below for great WMTY ideas and resources from MHVC and its partners. Buttons: Email "WMTY Button Request" to Liz Ramos, eliramos@montefiore.org, with the name and phone number of contact, organization, mailing address, and the number of buttons. There is no charge for MHVC partners. Tell us how you use WMTY and the difference it makes. Opt in to receive a special WMTY gift as thanks! Your MHVC "Online WMTY Toolkit"
Easy access to the most current and best WMTY resources. Visit this page often! Launch of WMTY Videos for WMTY Day! MHVC is sharing some videos put together by our WMTY friends in British Columbia. This short video contains tips and tools on how you can embed this question into every day practice. 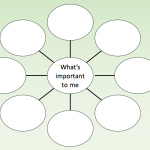 This video and others on the linked page can be shared to explain the importance of "What Matters to You?" and help health care providers and their patients share meaningful conversations. 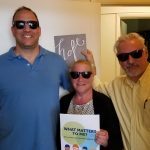 When Lorraine Horgan showed the WMTY video to Cabrini’s management at their annual strategic retreat on October 3, 2017, she was amazed at the enthusiastic response. “WMTY is really bringing patient-centered care to the next level. Everyone grasped the concept and looked forward to implementing it,” she said. 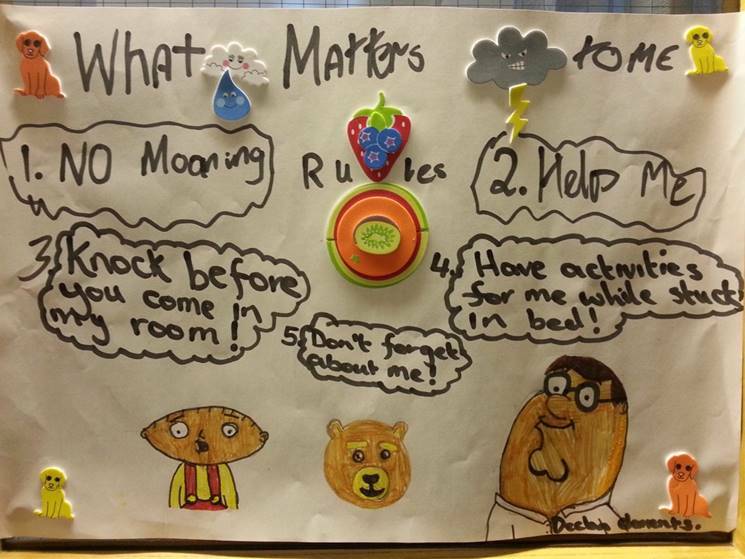 The impact was immediate and Horgan started making WMTY worksheets the next day. WMTY is discussed at monthly management meetings, where staff give examples of how it has made a difference. “The department heads presented WMTY to their staff, so now everyone at Cabrini knows about it,” Horgan said. Located in Dobbs Ferry, NY, Cabrini of Westchester is a geriatric care campus providing a continuum of care to elders and those with disabilities, so there are short-term patients and long-term residents. 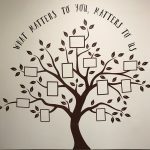 Of its 304 beds, all 45 short-term rehabilitation patients opted to have WMTY charts in their rooms, and now requests are coming from long-term residents. “We use the worksheet with circles from the video and it caused a ripple effect” said Horgan. 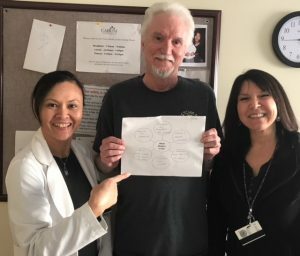 Patient John Murphy proudly holds his WMTY worksheet with Imee Garcia, PT (left) and Cheryl Cohen, OT (right), therapists who worked hard to help him reach his goals. News about the initiative has even reached Cabrini’s Board of Trustees. Horgan showed the video at the December Board meeting and gave an update on results. The Board was excited to see how deeply WMTY has penetrated and feels it is a great complement to the person-centered care that is an integral part of Cabrini’s culture. After a hip fracture, the patient was anxious to complete short-term rehabilitation in enough time to dance at his daughter’s Bat Mitzvah. Staff used this goal to motivate him, optimizing his therapy and quality outcomes. The patient was discharged in time for his daughter’s Bat Mitzvah, and healthy enough to celebrate with a dance. 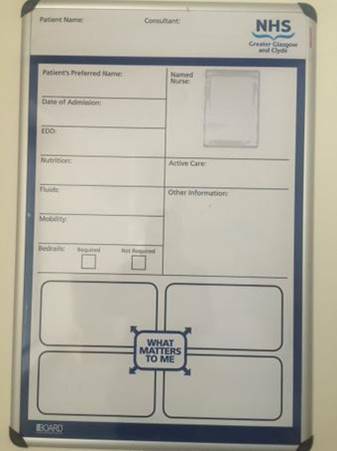 WMTY is for staff as well as for patients. When possible, adjusting work schedules allows for work-life balance and well-rested, healthy, and happy employees. “That is also part of WMTY,” said Horgan. Staff was concerned that a short-term rehab patient was too anxious to stop treatment and go home. When asked WMTY, she said wanted to get home to pay her bills. Staff then arranged for a day-pass and transportation to and from home. The patient was calmed and willing to participate in her therapy. If not for WMTY, she would have left against medical advice, resulting in a rehospitalization. Tweet to #WMTY18 to add to the WMTY conversation around the world!